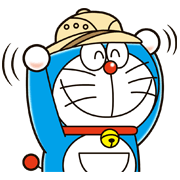 This sticker set features carefully selected frames from 5 different Doraemon films. Let Nobita and the gang spice up your chats with their big screen antics! How to get GIF of animated and PNG no background from LINE sticker?